2 floors for a maximum of 8 people. 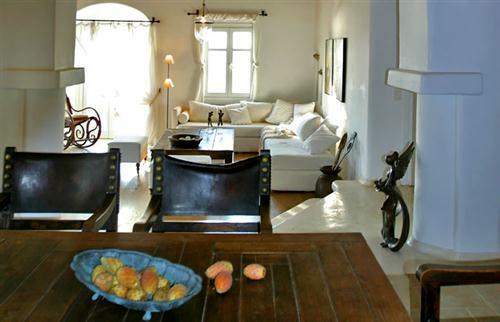 The villa's elegant decor features white and wooden furniture which blends harmoniously with the Cycladic architecture. Ground floor: Grand living-room stylishly furnished, with fireplace, colour television, small hi-fi (DVD-CD), fully equipped open plan kitchen with stove/oven, dishwasher and all utensils including a toaster and a dishwasher, dining area for 8, large master bedroom with en-suite bathroom and a sunken bath surrounded by natural rocks which connects to the terrace. Upper floor: 3 beautifully appointed twin bedrooms share 2 bathrooms with WC/shower, and each accesses a small balcony. 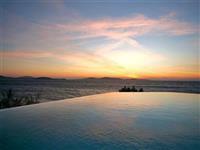 Villa facilities: Private infinity sea water pool stretches around large terraces. A shaded wooden pergola has large outdoor dining area w. BBQ & direct entrance to kitchen. All bedrooms have their own private sea view balcony. 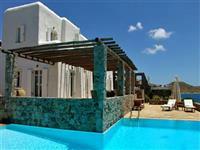 Stone walls provide a certain degree of privacy from neighboring equivalent level villa and residents. General amenities: parking area & shared driveway with the landlord's estate, 2 small beaches less then 300 metres away, a common communication room for internet use & faxes, maid service 2h ours daily with regular linen change, pool and garden maintenance, laundry service at extra cost, caretaker and staff look after guests whenever required, complimentary meet & assist at airport or port and transfer to the villa. Extra:A studio with separate entrance from the garden, located below the pool, can accommodate 2 extra guest in a small yet cosy bedroom w. en-suite bathroom and small kitchenette. 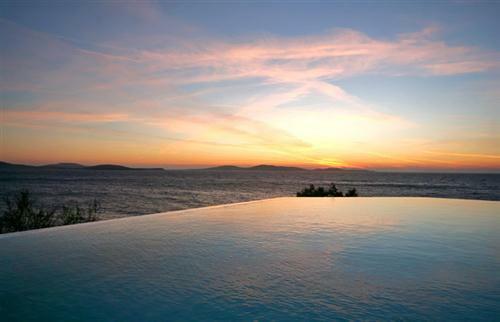 Mykonos is the perfect place for your holiday. It is cosmopolitan, friendly, and safe. 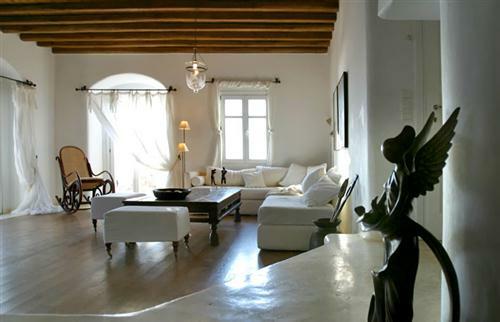 It is peaceful in the Spring, Autumn & Winter seasons and ideal for relaxing and romance. It is lively & busy in the Summer; a great vacation spot for fun and meeting friends from all over the world. In July and August there are great parties and there's loads to enjoy for both the young and young at heart. Mykonos offers some of the finest beaches in the Aegean, and a vibrant nightlife with a huge choice of clubs and restaurants in Greece. Kapari beach is used by locals and is not so well known to visitors. It is by a rocky hillside and the sea is clear. The area has a laid back atmosphere. 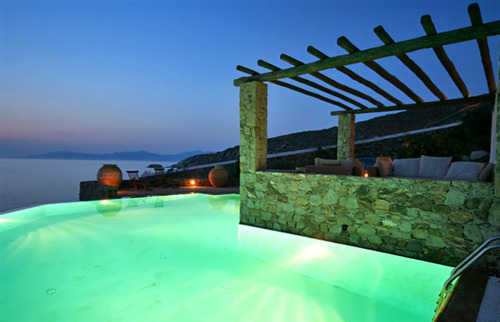 The villa is in the Agios Ioannis Bay area between two unspoiled beaches, with wonderful views over the Aegean Sea and the famous sacred island of Delos which is particularly beautiful at sunset. 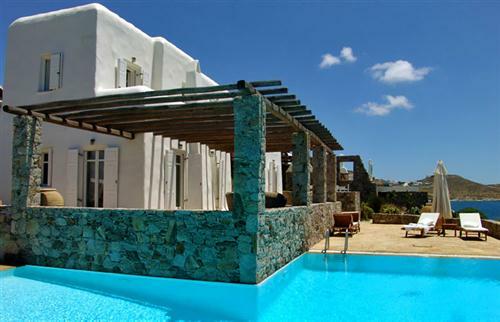 It is about 5km south-west of Mykonos Town and the neareast shops are at Ornos - less than 1km away. Local tavernas are about 500m away. The airport and port are about 5 km away. The map indicates the location of the property. Enlarge :: Help! If there are no rental rates showing please contact the owner! Notes: The master bedroom has an en-suite bathroom. 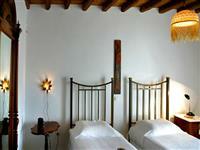 3 beautifully appointed twin bedrooms are share 2 bathrooms with WC/shower, and each accesses a small balcony. Notes: The three twin bedroom share 2 bathrooms with WC/shower. 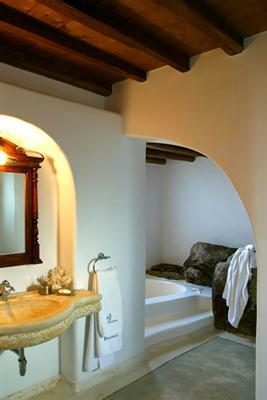 The master bedroom has an en-suite bathroom with a sunken bath. Please use the form below to send an enquiry to the owner. If you don't receive a reply within the next few days, please use the phone numbers at the top of this page to contact the owner directly.